This is one of those issues that at first glance seems hard to really get a handle on it, but the more you dig, the more you learn that the Sailor Moon series – in the manga, at least – has a pretty definite and reliable time line. Before we get further into this question (and inevitably come up with our answer), though, we need to lay out a few ground rules to help us identify what you’re really asking. First off, we are only considering the Dark Kingdom arc for the time being, or Acts 1 through 14 of the shinsouban manga re-release in 2003/2004.1 Next, and directly related to the first, we’re restricting our estimate to the manga right now, since the anime had far too many episodes and definitely makes things more difficult to calculate (though I’d enjoy taking a shot at it someday!). Finally, though we can give ourselves a minimum estimate due to how characters interact, the statements they make, and when one day runs right into the next, it’s unfortunately not possible to give ourselves a maximum estimate, shy of saying “it took less than a year.” So, now that we got that out of the way, how many days did the battle against the forces of the Dark Kingdom take? Thirty three days, or thereabout. So, let’s take a look at the breakdown! The following is an act-by-act analysis of how many days at an absolute minimum, along with the reasoning behind it. Where more than one day could have passed, I assumed the minimum. 1 day – Surprisingly, the first act takes place all within one day. Not much to say. 3 days – It’s not clear how much time passed between Acts 1 and 2, but Luna is still explaining the absolute basics to Usagi,2 so we can safely assume no time has passed. 3 days – Again, we don’t know how many days passed between Acts 2 and 3, but Ami remarks at the arcade with Luna and Usagi that she can’t believe she’s a sailor soldier,3 so it seems safe to assume that it’s the following day. 2 days –The Act starts with Luna researching Mamoru and Sailor Moon being in the paper, so we can safely say it’s the following day. 1 day – This is one of the first acts that really has a lot of uncertainty over how much time passed in between. We really have nothing to go on either way, other than the fact that Makoto appears in the end of the Act 4, and that Usagi and her friends talk about how great it would be to be a June bride.4 Since school hasn’t just begun (in April in Japan) and there was no long vacation (Golden Week,5 in the first week of May), we can assume that the story thus far has taken place in mid- to late-May. 3 days – An indefinite amount of time passes between when Zoisite first comes on TV and everyone starts to obsess over finding the crystal, though from the way the scenes play out, it almost suggests it’s either the same day, or chronologically close. I’ve assumed the minimum. 4 days – The amount of time to pass after Usagi wakes up at Mamoru’s house is unclear, so I’ve assumed the minimum. Later, when Naru is renting videos, she remarks that she planned to watch movies “all weekend,”6 and is wearing her school uniform, meaning it must have been a weekday, probably Friday. The next scene, she has those same videos (possibly to return them, on Monday),7 which is what gives us our estimate of four days. 2 days – Hard to say how much time has passed, so I assumed the minimum. 4 days – They spend time researching how to get to the Moon, Usagi asks her father to turn the Legendary Silver Crystal into a necklace, etc. so it’s a bit hard to say. I assumed a minimum of four days. 4 days – Umino, Naru, and Luna all remark that Usagi has been going to the game center “every day”9 to go see Endo. Assuming they all aren’t hugely exaggerating, I’d say this has to be no less than four days from what we see. 0 days – From here on out, the rest of the Acts take place on the same day. 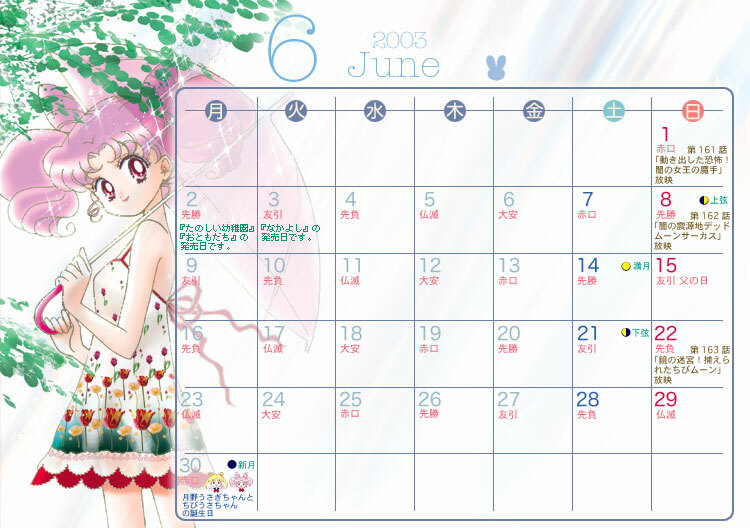 Seeing that Usagi’s June 30th birthday (as we discussed previously) doesn’t take place during the run of the Dark Kingdom arc, and that Mamoru’s August birthday is mentioned later in the Black Moon arc, it’s a safe bet that the series played out over the course of mid- to late-May and through June. Read also: What Food Did Makoto Make For Her Lunch? I don’t know about you, but with all of Usagi’s talk about being a slacker, loving sleep, and her family and friends talking about never getting stuff done, I’d say she had a pretty eventful month. Saving the world in 30 days is pretty good for anyway, especially a self-proclaimed slacker! ← Why is Rei So Different in the Anime and Manga? Most of this fits well enough: “Casablanca Memory” has a Zoisite scheme go off in June, and Act 19 seems to have Usagi claiming that she first stayed at Mamoru’s apartment earlier that same summer, which would have been between Zoisite schemes in Acts 6 and 7, after meeting Mamoru just that past spring. What doesn’t make as much sense is why Rei’s school holds a May festival in Act 15, after the Dark Kingdom has already been defeated, and why the calendar in Act 19 is of August 1993 while Act 6 shows a 1992 newspaper if they’re supposed to happen in the same year. It’s probably better to assume that those are mistakes of when they were written than to try to imagine a whole extra year passing within such a tightly-plotted story, but whether you settle on 1992 or 1993 does affect whether Act 10 takes place in the middle of the month or more toward the beginning of the month, since they were aiming for a full moon.